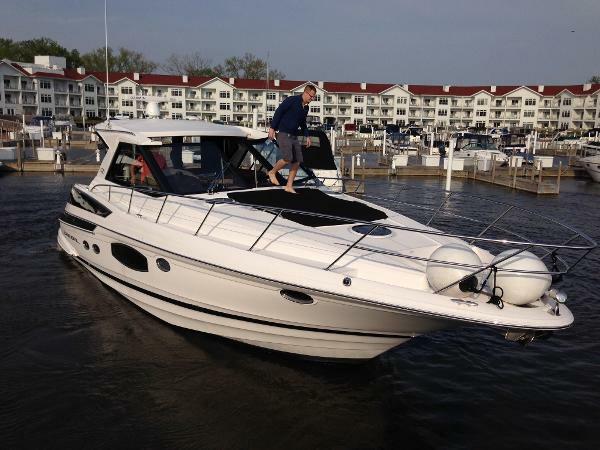 Like NEW - Regal 46 Sport Coupe in superb condition with only 162 hours! 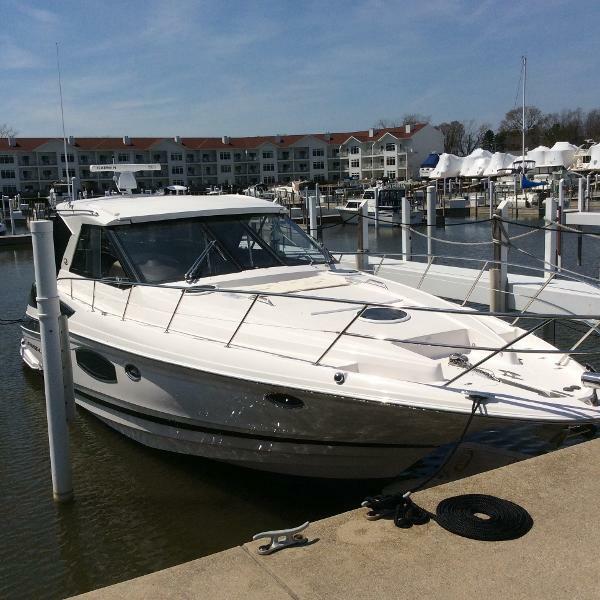 The Regal 46 Sport Coupe is one of the most successful hardtop express cruisers in its class. 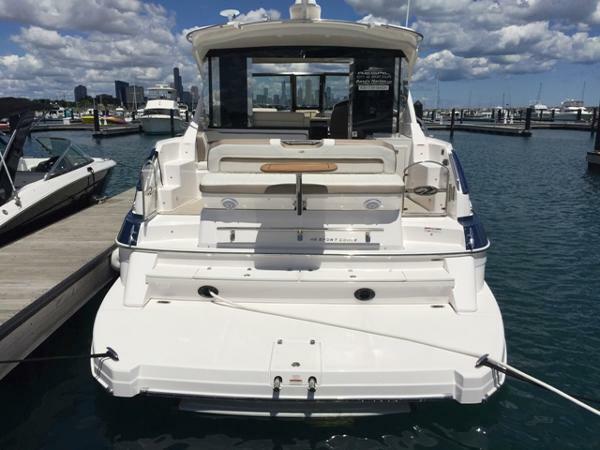 Her success and popularity are achieved by incorporating exceptional style and capability into a high build-quality including: Volvo Penta IPS pod drives with Joystick controls, a retractable full-beam hardtop over a stand-up helm, high-end Garmin electronics package, a full galley down complemented by an in-cockpit additional refreshment center (with grill, refrigerator and freezer), an ample chaise sunlounge on the foredeck, 2 spacious cabins and 2 ensuite heads (a king sized berth in the Master cabin aft and over 6' of headroom which is unusual for this class of vessel). A retractable large screen HD TV in the salon is viewed from an L-shaped seating area that comfortably seats 6 people around a high-gloss cherry table. Air Conditioning (and heat) has 3 separate zones, to ensure all spaces are comfortable with digital thermostats controlling each. 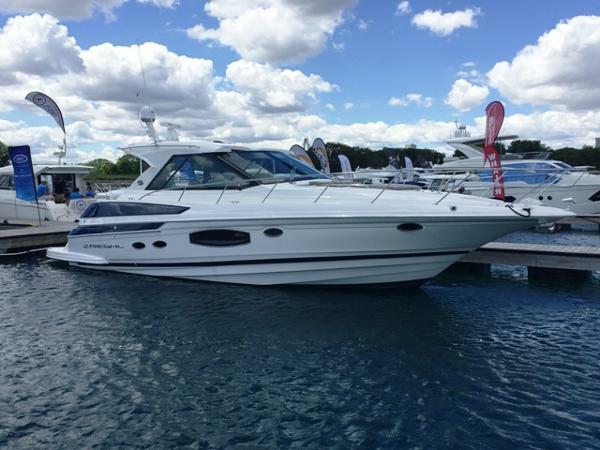 Be sure and watch the video of this beautiful Regal 46 under way recently in the Atlantic ocean, showing off her Euro-inspired styling and superb handling at 25 knots. 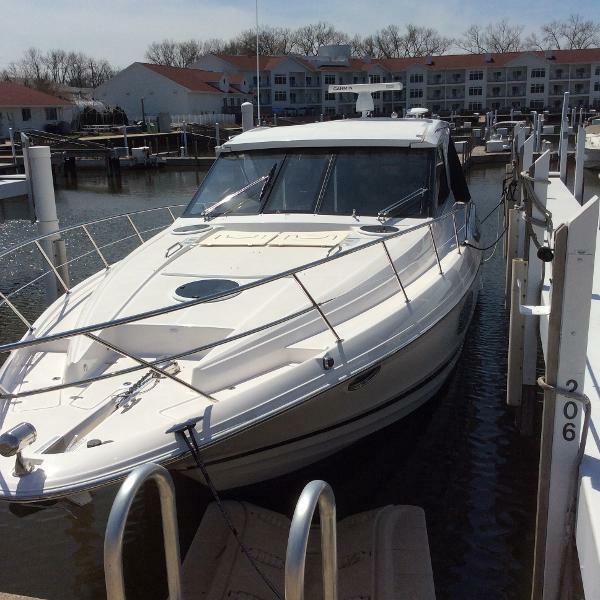 She is quite a versatile sport cruiser for travelling and entertaining in comfort and style. 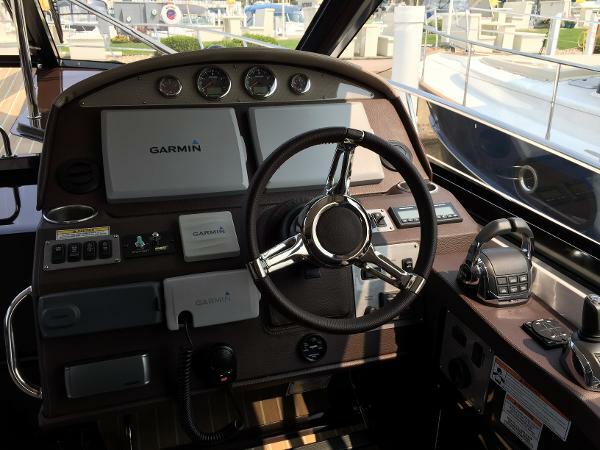 Unlike many coupes and hardtops in her class, a tall captain can stand while steering without opening the overhead, or can sit in comfort with his or her mate, seated together on the generous double-wide helm seat. 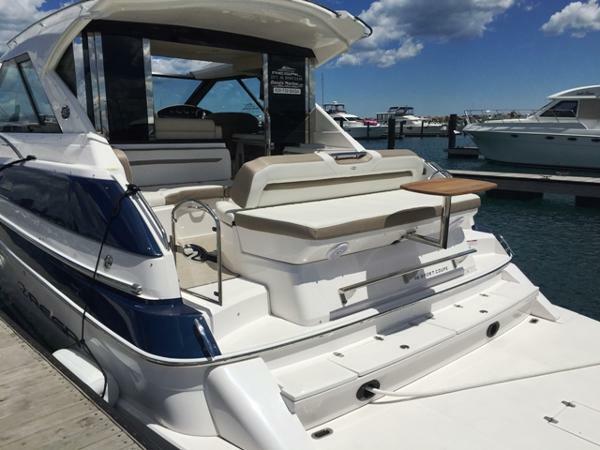 The Regal 46 Sport Coupe has both a conventional cockpit and an afterdeck with table (many vessels in this class have one or the other) in addition to a large swim platform. 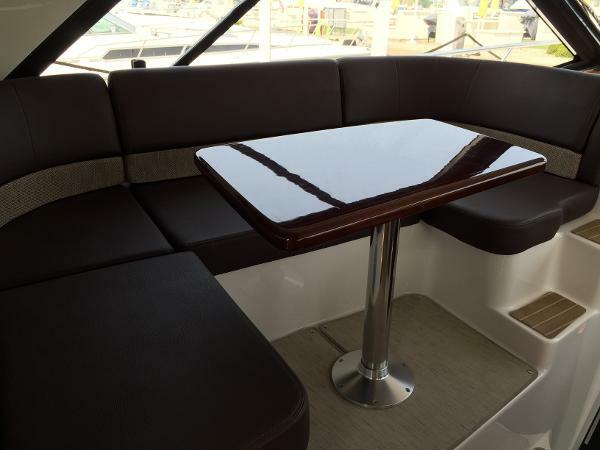 From the salon forward there is a walkthrough windscreen that is both wide and tall, providing easy access to the foredeck for line handling and to enjoy the chaise lounge sun pads. The essence of the 46 Sport Coupe is great design, flawlessly executed. We would like to invite you to explore how this award winning yacht inspires your sense of style, comfort and passion? Just reduced AGAIN! 100 % maintained and in perfect working condition! Fresh water use only! 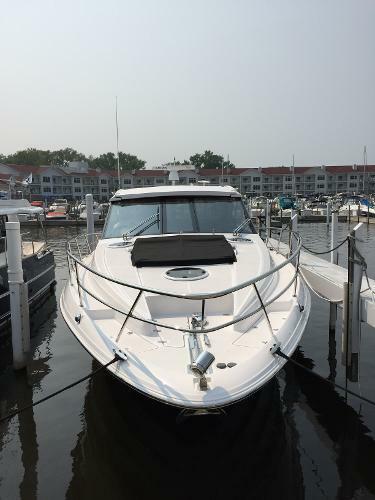 Please call for details regarding this beautiful yacht. 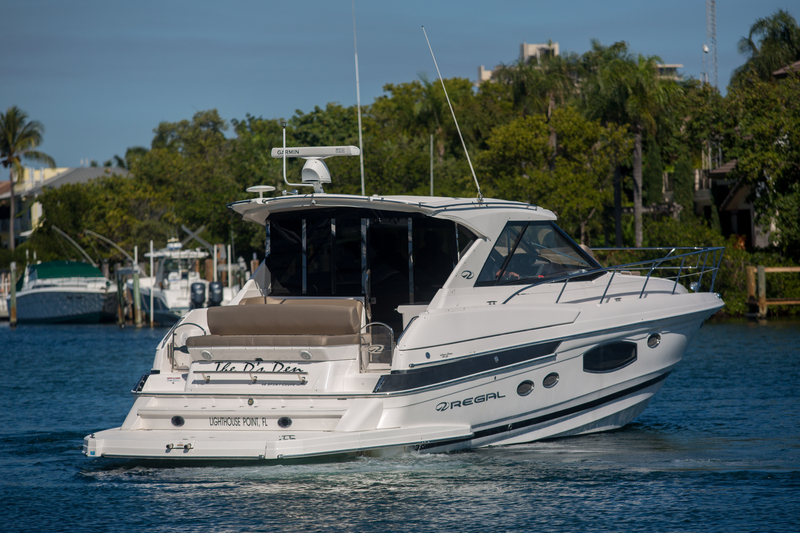 Dash has been upgraded to new 7612 Garmins with glass dash.This boat is equipped with a classic white hull, glacier boot stripe and aft vents, Espresso fwd and Boca aft cockpit interior, high gloss blk cherry cabinetry, cabin fabric in Dawn/ Midnight bloom, Radiant Shimmer corian, salon floor in Birch and Rosewood, fwd/aft cabin floors are textured carpet, bow sun pad cover, windshield cover, aft curtain, cockpit enclosure sliding doors, cockpit aft sectional filler, blk cherry high gloss cockpit table fwd, cockpit pillows (4), cool cockpit, electric shore cord reel sys, electric grill for wet bar, electric lift helm seat, icemaker in cockpit, oil change system, satellite marine weather, cockpit tv/dvd, mid cabin tv/dvd, underwater lighting, washer/dryer, wiper w/ washer port side, aft sunpad backrest pillows, aft sunpad ss footrest, autopilot for IPS, garmin depth/ fish finder, Garmin HD open array radar, 2nd Garmin 7212 plotter, and much more! Please call our sales staff for further info!